16 energy-saving tips that will make summer in Phoenix more manageable than you think! 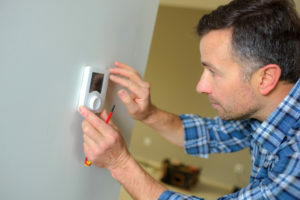 Whether you’re a long-time resident of Phoenix or recently relocated and settling into your first West Valley home, chances are you’re at least a bit apprehensive about the cost of keeping your home cool enough to be comfortable throughout the sweltering desert summer. Staying cool and comfortable during Arizona’s summer months is vital to your health, well-being, and will to live. So the best approach is to make energy efficiency a priority. In Phoenix, a household’s air conditioning can account for 50 percent or more of the total electric bill in summer. But if you follow these tips for maximizing energy efficiency, come September you might be amazed at how affordably you survived the season. 1. Keep air vents open. Closed air vents in more than 10 percent of your air-conditioned living space produce a pressure imbalance that ultimately reduces the cooling system’s effectiveness. 2. Mop floors and run laundry between dusk and dawn. Reduce the load on your home’s cooling system by following the next steps to reduce the transfer of heat into your home (heat gain) from a variety of sources, primarily the sun and absorption of heat to which homes in the desert are particularly susceptible, especially in summer. Here’s how to reduce heat gain inside the home. Install a programmable (smart) thermostat and set it to between 78 – 80 degrees when you’re at home and set it at 5 to 10 degrees higher when you’re away from home. Then set the thermostat to adjust to a comfortable temperature an hour or so before you return home during off-peak energy usage hours. Every degree you set your thermostat above 80 degrees translates to energy cost savings of about 2 to 3 percent. 4. Set the air conditioning fan on “auto” to keep the fan’s motor from running when the A/C unit is not cooling to further reduce energy costs. 5. Schedule maintenance service on your cooling system once a year to maintain its efficiency and head off any potential problems. Make sure to enlist a certified contractor for maintenance inspections. 6. When it comes time to replace your cooling system, look for a unit with a high seasonal energy efficiency ratio (SEER) rating. A Seer rating is the ratio of the cooling output of an air conditioner over a typical cooling season, divided by the energy it consumed in Watt-Hours. The seasonal energy efficiency ratio (SEER) efficiency of heat pumps and air conditioners is demonstrated by this ratio. The higher the SEER rating, the more efficiently the unit will cool your home. Talk to a qualified air conditioning contractor to find out what level is right for your home. 7. Make sure your cooling system is the right size for your home. While it may seem like a bigger unit would be the better option for summertime in the Vallet of the Sun, if it’s too large for your home it will result in frequent or short cycling, causing it to operate inefficiently and run up your energy costs. 8. Position ceiling fans to blow downward during the summer. This helps circulate air in the home, reducing the need to lower your thermostat. 9. Keep your outdoor A/C unit clean and free from debris and obstructions to protect the components from damage. 10. Clean permanent A/C air filters or replace disposable filters at least once every month. A dirty air filter forces the equipment to work harder, and up go your energy costs. Evaporative coolers (swamp coolers) work to reduce air temperatures just as the name suggests–through the evaporation of water. These units work well in dry environments like Arizona’s. Like your air conditioning unit, evaporative coolers need to be used properly and maintained for peak efficiency. 11 Change the evaporative cooler’s pads each year before summer. Ensure the pads are evenly installed in the frames with no gaps around the edges. 12. Do not run your evaporative cooler and air conditioner at the same time or even on the same day–your A/C unit is working to remove moisture from the air while your evaporative cooler’s job is to add moisture to the air, which means you’d be running the two systems against each other and running your energy bills up. 13. Install the baffle plate (damper) in the evaporative cooler before switching over to air conditioning. 14. Protect against heat gain with window finishings. Window shades and white or light colored curtains or drapes can help keep the heat out, simply by closing them during the day, when the sun is most intense. The U.S. Dept. of Energy estimates that closed curtains can reduce the amount of heat entering a home by 45 percent. Aluminum foil and cardboard—what every energy-efficient Phoenix home is wearing. 15. Another simple measure, while not as visually appealing as it is effective, involves cardboard and aluminum foil. Cover pieces of cardboard with foil and place them between your windows and curtains to reflect the heat back outside and away from your home. 16. Outdoor awnings will throw serious shade on your home. Outdoor awnings are another great way to inhibit hear gain inside your home. They provide ample shade over windows and glass doors, blocking the sun substantially. Strategically placed outdoor awnings can actually reduce the heat entering your home by eighty percent! Thankfully, the West Valley is home to an endless variety of restaurants, clubs, museums, and social hotspots for you to explore this summer. Go out a little more often, stay out a little later and enjoy the complementary airconditioning with friends and family. And, of course, the go-to heat-beater during Phoenix summers is the backyard swimming pool.